Check out the article on page 11 of todays (16/12/2011) Tasmanian Country newspaper. It would have been better if the picture was included to show farmers what the floor looked like. NEW Zealand plantation-grown blackwood floor demonstrates the potential for a new revenue source for farmers in Tasmania. Dr Gordon Bradbury, a forester with 30 years experience, is endeavouring to establish a commercially-focused Tasmanian Blackwood Growers Co-operative to emulate the success of the New Zealand farmers. “Many farms have a steep wet gully or slope that only grows blackberries and bracken. These unproductive areas could potentially be used to grow blackwood,'' Dr Bradbury said. “This commercial opportunity does not exist in Tasmania just yet.'' 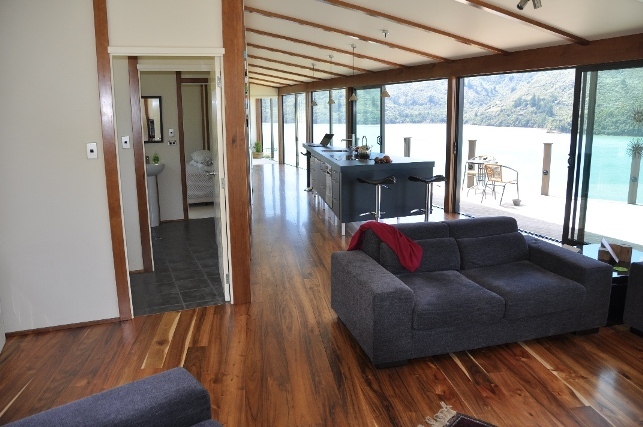 The 2011 New Zealand Master Builder House of the Year features a blackwood timber floor. Not blackwood imported from Tasmania, however, but 15-20 year old New Zealand plantation grown trees. Dr Bradbury said the award is a major boost for New Zealand farmers who are on the verge of their first significant harvests of plantation blackwood. The Tasmanian Farmers and Graziers Association (TFGA), who represents private foresters, backs opportunities for farmers to explore sources of revenue. “This is one of many opportunities floating about, but the fullness of time will sort out its feasibility,'' TFGA boss Jan Davis said. Ms Davis said the blackwood co-operative would require serious commitment from the industry to see it through. Dr Bradbury said the proposed co-operative would assist farmers to forest manage their native blackwood for wood production, genetic conservation, and the environment. He said farmers could grow blackwood in plantations to produce high value, high quality blackwood timber for local and export markets. “A major objective of the co-operative would be to establish a blackwood breeding program to improve the quality and consistency of plantation timber,'' Dr Bradbury said. Australian Forest Growers (AFG), which is a national organisation which includes representing farm plantation growers, said it is a step towards a sustainable privately owned high-value resource. Dr Bradbury, who has completed a PhD at UTas on blackwood wood quality and genetics, is seeking community support and industry support to establish the co-operative under the industry reforms outlined in the Tasmanian Forest Inter-Governmental Agreement (TFIA). “If New Zealand farmers can do it, why can't we?'' he said.